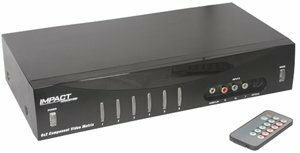 The 6x2 Component Video Matrix Selector is the ultimate controller for high definition and progressive scan video sources. This HDTV selector allows you to simultaneously route any of six source devices to two separate TV/monitors or one source to two TV/monitors. Connect all your HDTV products such as DVD players, satellite receivers, cable set-top boxes, or gaming systems, and use the remote control or front panel buttons to watch any picture on either of two plasma, CRT, LCD or projection televisions with complete independence!This switch offers six component video inputs, six stereo audio inputs, and six optical digital audio TOSlink inputs. It will switch all of these inputs to either of the two outputs, with the audio following video. Comes complete with an infrared remote control that features discrete commands to make programming complex macros into your universal remote control system a snap. Now you can take control of your system and watch what you want, where you want, and do it with no compromises! I read several reviews about different component switches, and this product seemed to be the best-reviewed. Apparently with good reason. I pulled the ole' 55" CRT RPTV out from the corner, hooked up the two component inputs to the switch, pushed it back into the corner. I hooked up the DVD player, the Wii, the HD TiVo, the MythTV. Absolutely no degradation of the signal at 480p (dvd and Wii) or 1080i (HD TiVo and MythTV). I haven't tested it at 1080P or 720P obviously, since my CRT TV won't handle 720P. I can say that, if anything, the other devices may actually look clearer, and I can run the TiVo and the MythTV normally, and only switch if I want to play TiVo or a DVD. I do wish it would automatically switch to a new input when a new signal is introduced (i.e. the Wii or DVD player are turned on) but the included remote does OK, and I have programmed my URC 10820 to handle my main inputs anyway. I also wish it could be set up to be always-on. Turning it on after a power-outage seems unnecessary. The video quality was excellent without any noticeable degradation. My only (serious) problem was the manufacturer's oversight of not including audio conversion between the unit's two included audio input formats: L/R RCA and optical. I understand that it's pointless to upconvert stereo to optical, but they could have easily included a downgrade conversion from optical to stereo. I am using this in conjunction with component video baluns to distribute HDTV from components in the basement to the bedrooms upstairs, and it works great! Video equipment is relegated to the basement, including the Cables To Go matrix switch. We have 2 TiVos and a DVD player; with all these inputs we still have capacity for 3 more devices. Each of the matrix switch outputs is connected to a CE LABS CAT5TX CAT-5 HD A/V Transmitter. In each bedroom, there is a CE LABS CAT5RX CAT-5 HD A/V Receiver; of course there are 2 Cat5 cables connecting each transmitter to its receiver. See my reviews of these baluns for details. The result is that you can get a great HD picture and sound in each bedroom, with the ability to independently select different video sources in each location. I had an existing IR distribution system, so getting the remote control signal down to the basement was no problem. However for a multi-room setup, the missing piece was that the unit comes with only one remote control! I guess they never anticipated that the displays might be in different rooms. To solve this, I went to the Cables To Go web site and ordered a 2nd "replacement" remote control. All in all it works very well!